Pictured above is a bluff of St. Peter Sandstone exhibiting some spectacular black staining. The bluff is exposed near the confluence of Sylamore Creek and the White River north of Mountain View, Arkansas. Bluffs with this staining are referred to as “painted” because it looks like paint has been poured over the face of the rock. The stains, which are manganese oxide, were deposited by groundwater as it seeped from the sandstone. The St. Peter Sandstone contains a minute amount of manganese that gets picked up by water as it flows through the rock. When the groundwater flows out of the sandstone, some of it evaporates leaving the manganese behind. Over time, a coating of manganese builds up on the bluff face. 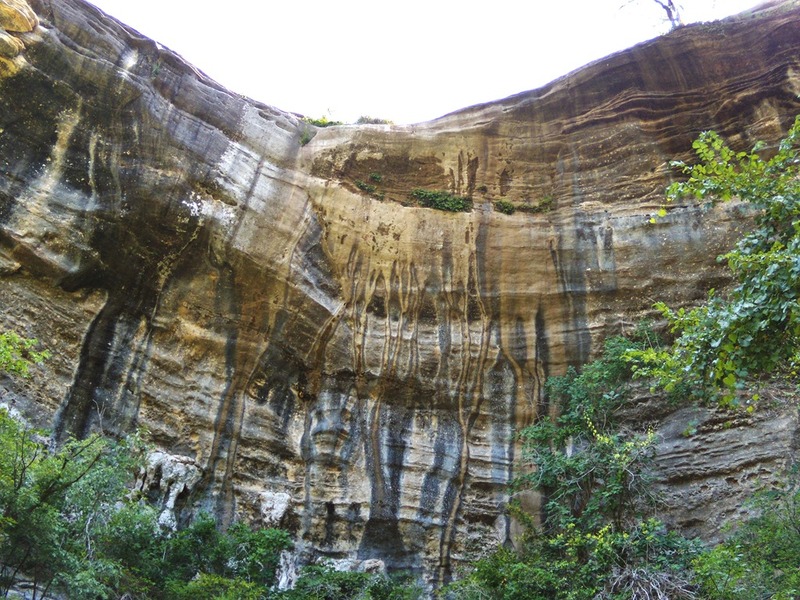 The St. Peter Sandstone is also found along certain reaches of the Buffalo National River. The “Painted Bluff” – as it is known locally to river folk – is another great example of manganese staining. This entry was posted in #geoblog, GeoPic of the Week, Sedimentary Features and tagged Arkansas, Buffalo National River, manganese staining, mountain view, Ozark Plateaus, St. Peter Sandstone, Sylamore Creek, White River on February 18, 2016 by argeology.